Study abroad programs are becoming increasingly popular for our students. Crystal Lantz, Director of International Scholar Services, works closely with students who want a global experience. Email crystal.lantz@wilson.edu to set up an advising appointment for more information about study abroad! Cultural Experiences Abroad (CEA) – CEA has semester, summer, and internship programs in Argentina, Chile, China, Costa Rica, Czech Republic, England, France, Germany, Ireland, Italy, and Spain. The Washington Center – Wilson students may also participate in the Washington Semester consortium program, which includes an internship and coursework in Washington, D.C. PA residents are eligible to apply for scholarships. June 2019 Mexico – In partnership with conservation research organization Operation Wallacea, Dr. Abigail Berkey and Professor Christine Mayer will lead the Experiential Tropical Ecology course (Biology 270). Course dates are June 24 – July 7. Information sessions to be held on campus early in the fall 2018 semester, and applications will be due by the end of the semester. January 2020 Dominican Republic – Nursing and Medical Spanish Service Trip led by Dr. Carolyn Hart and Dr. Wendell Smith. Information sessions will be held on campus beginning in the spring 2019 semester. A great option for VMT majors, EcoLife Expeditions’ Vets in the Wild program can work to fulfill credits or complete an internship requirement. The Bahrom International Program (BIP)at Seoul Women’s University (SWU) is a four-week program that introduces students to Korean culture. The program is open to both men and women, and is taught in English. BIP consists of lectures, field trips, group activities, and cultural excursions. Participants complete academic assignments as well, and Wilson College students earn 3 NWC credits. In 2018, the only costs to participate were a program fee ($400), round-trip airfare, and spending money (food for evening and weekend meals, transportation for personal travel, souvenirs, etc.). Ewha Womans University International Summer College, in Seoul, South Korea. This program is also open to both women and men, and Wilson College students will earn 3 NWC credits upon successful completion of the program. Hannam University in Daejeon, South Korea, offers a Korean Studies Summer Program. Wilson College students will earn 3 NWC credits upon successful completion of the program. The Irish American Scholars Program allows a few Wilson College students to be nominated each year for the opportunity to study, tuition free, at a college or university in Northern Ireland for one or two semesters. See the promotional flyer for more information, and please contact Crystal with any questions about the program. 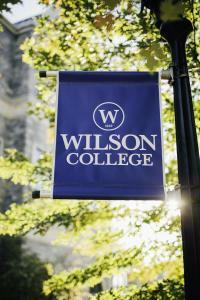 Each semester, Wilson College students may apply for institutional study abroad scholarships. Application forms and deadlines will be sent out to all students via email throughout the academic year.